McNair was hospitalized after a team workout on May 29, and a GoFundMe page for his mother says he received a liver transplant. Maryland announced June 13 that he'd passed away. Maryland sophomore offensive lineman Jordan McNair has passed away at age 19. McNair was hospitalized following an organized team workout May 29, which the school announced June 4, saying then that he was in “critical, but stable” condition. The school then announced his death Wednesday. McNair played in one game last season as a freshman. 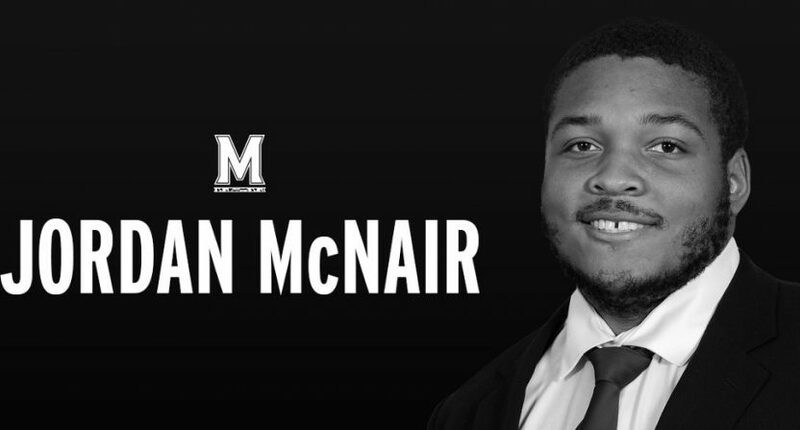 Today the Maryland family mourns the passing of Jordan McNair. We are deeply saddened by the tragic loss of one of our student-athletes, sophomore football player Jordan McNair. Jordan was a tremendous athlete, student, teammate and friend, and he will be sorely missed. We offer our deepest condolences to his parents, family and friends. opportunity to know Jordan, you understand the sadness we are feeling. by the spirit of this brave fighter. Please continue to pray for Jordan’s family during this difficult time. On June 5 (last Tuesday), a GoFundMe page titled “Jordan McNair’s Family Support Fund” was created on behalf of McNair’s mother, Tonya Wilson. It has raised over $25,000 of its $20,000 goal as of Wednesday afternoon. Here’s the video on the page, which talks about how McNair was “airlifted to R Adams Cowley Shock Trauma Center in Baltimore, Maryland” after the workout, how he “received a liver transplant and has been fighting for his life for the past week,” and how his family had been staying by his side. A tweet from someone from a different school isn’t proof that McNair’s issues did come from heatstroke (and even if they did, there’s a jump from that to the school being responsible or liable for his death), but there are going to be a whole lot of questions asked about the Terrapins’ workout in the wake of this situation. We’ll see what answers Maryland offers.